Whenever I come to Osaka I like to stay at U-En. The location is almost perfect, with a station of the JR Osaka Loop-Line just a short walk away and Osaka Central Station quite close, too. The Guesthouse has always a nice and very friendly atmosphere with very helpful and kind staff members. The beds are clean and just besides the bed you can lock away your valuables. And last but not least the little cafe on the ground floor offers delicious coffee, snacks and craft beer. Das Hostel liegt mitten in Fukushima, nahe an mehreren U-Bahn Stationen und Bahnhöfen, so dass man leicht und schnell auch zu weiter entfernten Orten kommt. Zahlreiche gute Restaurants und Bars in der Nähe, trotzdem nicht laut. Beim Check-In bekommt man eine Karte zur Orientierung inkl. sehr guter Restaurant Empfehlungen sowie eine U-Bahn Karte. Unten gibt es ein Cafe und oben einen netten Gemeinschaftsraum mit Küche. Sehr freundliches Personal. Gute Sicherheit (nachts Zugang nur mit Passcode). Great hostel, nice cafe downstairs (although a bit on the pricey side). Wirklich ganz tolles Hostel! Sehr sauber. Wir waren in einem 4er Damenschlafsaal und wir konnten super schlafen. Nette Gegend und schnell an der Station! Bestes Hostel meines Japan-Aufenthaltes! Gute Lage, tolle Leute, bequeme Betten, alles sauber und on top gibt es noch das tolle Café im Erdgeschoss, wo es richtig guten Kaffee gibt und frische Croissants! Kann ich jedem nur empfehlen! Guesthouse U-En is a great place to stay in Osaka. I was staying here for the third time because I like it so much. It's located in small, nice street and at the same time it's pretty close to Osaka station. So it's easy to come around. The hostel has a little cafe on the ground floor and the staff is extremely nice and helpful. I would definitely recommend to stay there. This place is awesome! I will sure stay again there the next time I'll come to Osaka. Here you can really feel as at home. 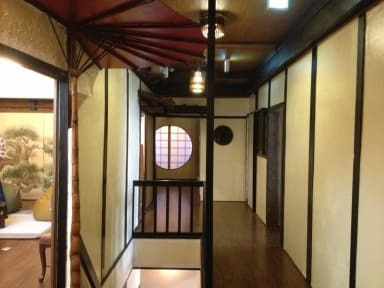 This hostel is the perfect mixture of japanese traditon and a modern hostel. In addition the hostel is located to Fukushima station which is connected to the Osaka-loop-line, with which you can reach nearly all the sightseeing places of Osaka. Totally recommend this place!! The Hostel is very well located right in the middle of the Fukushima neighbourhood and there are lots of small bars and restaurants in the lively little streets around it. 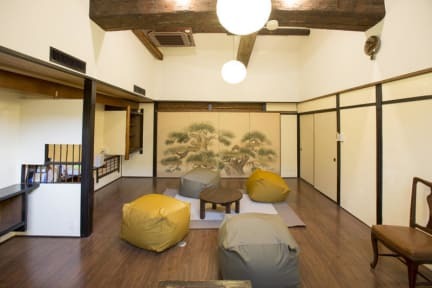 The place itself is very cozy and super clean and the house is an old japanish wooden guest house which boosts the cozy atmosphere a bit more. The staff is nice and helpful and there is a restaurant attached to the hostel which might be good as well since it was crowded most of the times.